Online advertising is becoming increasingly annoying, but many small publishers like Arseblog are highly dependent on it for the revenue it provides. The business model of creating content and giving it away for free is not a particularly great one, and because of ad-blockers and people’s growing disdain for ads, it’s becoming more difficult to make ends meet. There is another way though, and that’s support from our readers and listeners. If you enjoy what we do and you’d also like access to exclusive podcasts and articles, then sign up as an Arseblog member via Patreon. We don’t do clickbait, we don’t do pop-ups, pop-unders, auto-playing videos or 17 things you learned about that thing you never needed to learn anything about anyway. What we do is create great quality writing and podcasts. We have a team of people who love to write and talk about the team they love. And if you get on board, we’ll love you too. I mean, we love you anyway, but we’d love you just a little bit more. Does this mean you’re going behind a paywall? No! Everything that we do already on Arseblog and Arseblog News remains free, the same as it always has been. The podcasts, the blogs, the news articles, match reports, stats, player ratings, columnists and everything else – 100% free. But if you sign up to become an Arseblog member on Patreon you get a little bit more. The minimum cost is just €5 per month + VAT if you’re in an EU country, otherwise there’s no VAT to pay. That works out at just £4.40 or around $6 (the amount on Patreon shows up in dollars as that’s the only currency they currently deal in). That’s barely the cost of a pint, a couple of takeaway coffees, or two-thirds of what’s left of the Arsenal transfer budget after our January shenanigans ? If you feel like you want to contribute more, you can modify the amount before you sign up (see FAQ). My Arse – a chat with a well known Arsenal fans about their life and times as a Gooner. Interactive Arseblog & Gunnerblog phone in shows. History specials – such as our two-part podcast about the Invincible season. A monthly Arseblog long-read featuring great writers who will look at a particular aspect of the club, a time period, a player, an achievement etc. Something for you to really sink your teeth into. There’s also an exclusive monthly email for members, discounts on merchandise (when we get some), advance notice of tickets for live podcasts and events, and other things too – as soon as we think of them. You also get our love and thanks for being part of the Arseblog member community, and the knowledge that your contribution will help us do more, so you get more in the long-term. It’s simple. Everything you need to know is in the FAQ below, and if you have a question that’s not included, or if something’s not clear, you can get in touch directly and we’ll sort it out as best we can. Patreon is a membership platform that makes it easy for us to provide exclusive content to our members, and for them to subscribe with the knowledge that their security and privacy are in safe hands. They offer support to all users via their helpdesk, and there are no long term commitments. You can cancel your Arseblog subscription at any time and the platform itself allows us to give you podcasts and articles that are exclusive to Arseblog members. Patreon is used by thousands of artists, singers, writers, podcasters, video-makers and more, and it means we can concentrate on making you great stuff to listen to and to read, while they do all the technical stuff behind the scenes. 18 of 20 found this answer helpful. How do I become an Arseblog member on Patreon? It’s really simple. If you’re already using Patreon, you can simply go to our page and become a patron and an Arseblog Member. If this is your first time to use Patreon, follow these steps to get going. 3 – Choose the $6 option (this is equal to €5 – or just £4.40! ), and sign up to Patreon with your email address or with your Facebook account. If you feel you want to pledge more than the $6, you can simply modify the amount in the box, and that will become your monthly amount. It is possible to pledge less but because of the way the Patreon system works, you won’t be able to access the content if you do. 4 – Choose to pay securely with your credit card or Paypal account. 5 – That’s it. You’re now an Arseblog Member, you have access to exclusive podcasts and written content, and we love you for it. 16 of 17 found this answer helpful. How do I listen to the podcasts on my podcast app? When you sign up to become an Arseblog Member, you’ll get a unique, individual URL which will allow you to access the podcasts. 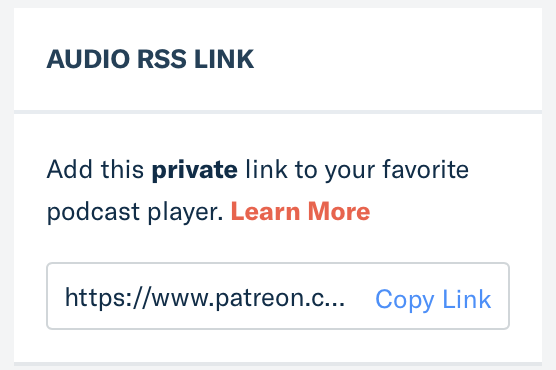 IMPORTANT: Do not share this URL as multiple uses will see Patreon block that feed’s access to the content and you won’t be able to listen to our cool shows. The method to add the podcast to the wide range of podcast apps varies a little, but basically you need to copy the link, and add the podcasts manually. Paste the Patreon link you copied in there, save the changes, and you’ll be subscribed. After that, new episodes will appear in the app as with any other podcast. Both of these apps are free and support the Patreon podcasts. Currently there are compatibility issues with apps like Stitcher and Acast. 11 of 12 found this answer helpful. Unfortunately, at this moment in time, there’s no way of integrating the Patreon content into our own apps, so you’ll have to read them via their website. All the content, podcasts and written articles, are available at patreon.com/arseblog/posts. You will have to be logged into your Patreon account to be able to access them. In your email preferences, you can choose to turn on notifications so when a new post is made you get an email alert about it. 7 of 8 found this answer helpful. What’s the story with dollars and VAT? At the moment Patreon only uses dollars, so that’s the only currency available to us. The $6 amount works out at €5 per month. With regards to VAT (value-added tax), all business in Europe have to charge this on goods and services, including digital services. VAT is charged at your local rate. If you’re in Ireland, its 23%, in the UK it’s 20%, Germany 19% and so on. If you’re from outside the EU, the VAT charge does not apply. 11 of 13 found this answer helpful. Payments are taken on the first of every month. 15 of 16 found this answer helpful. How do I change my payment method or info? If you need to change your payment method, or update your credit card/Paypal information, Patreon provide a full how-to on their website. Click here to follow the steps. 6 of 8 found this answer helpful. If you want to cancel, follow these simple steps. 1 – Log into your Patreon account. 2 – In the top right, choose ‘My pledges’ from the drop-down menu. 3 – You’ll see a list of the creators you’re supporting, it may be more than one. To the right of the Arseblog one, choose ‘edit pledge or shipping address’. 4 – On the right hand side, choose ‘delete pledge’. We’ll be sorry to see you go, but thanks for your support along the way ? 8 of 9 found this answer helpful. I have another question, how do I get in touch? If you don’t see the question you need an answer for here, please feel free to get in touch directly. Before you do, if it’s a Patreon specific question, they may already have an answer on their helpdesk. You can check that out, and search for answers, right here. If you don’t find the answer you need, just drop us an email to [email protected] and we’ll do our best to help you asap.